Decades before the scientific community and the general public realized that a healthy body requires strength training, one man was already at it: Jack LaLanne. Last Sunday the iconic figure died at the age of 96. 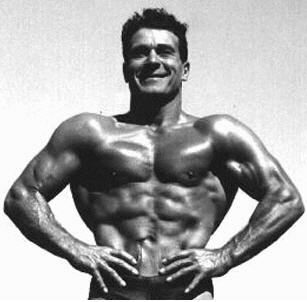 Jack Lalanne was born 1914 in San Francisco, California, to French immigrants and later described himself as a “miserable goddamn kid” that frequently got into fights. Things changed when at age 15 he developed an interest in exercise and nutrition and studied Henry Gray’s Anatomy of the Human Body. After graduating from High School, he attended night classes at a Chiropractic College and finished with a Doctor of Chiropractic. In 1936, at the age of 21, he opened the first of his own health spas in Oakland, California, where he also designed the first leg extension and pulley machines for usage as weightlifting devices, which he felt could aid people further on the course to health. Which is what he always saw at the heart of it: Improving your well-being through physical exercise. This was his message to everyone, including women, whom he encouraged to train their bodies as well – in that era an especially unusual recommendation. Mostly his exercises required no equipment other than a chair, making it very easy to join him in doing what he demonstrated. And he patiently explained to viewers why and how he was doing what he was doing: “We’re going to work this thing out together,” he told those in front of the television. I may not agree with everything Jack preached, especially when in his later life he started marketing vitamin supplements and juicers and came up with the “if it tastes good, spit it out” rule, that for my feeling is too hostile to the fact that food should be enjoyed too. But there is no doubt that Jack was way ahead of everyone else in realizing how important the right amount of strength training and a more conscious nutrition are for physical health and he lived his life as a glowing example of it. It’s probably no coincidence that he lived up to 96 years old too! And, perhaps most importantly, he wasn’t barely alive, he was able to enjoy those later years as well! I saw a program from like 2 years back and he was still going to the gym. The quality of life is in my oppinion the most important thing. It’s no good to live for a 100 years if you spend your last 20 years drooling and looking out of a window in a nursing home. Yep! Who wants to live like that? I just watched some parts of his show and damn, now I understand why people constantly say he was way ahead of his time. Just look at what he talked about, I felt like it was a show I could have just found zapping thru some TV channels. Yep. A lot of his stuff could have been filmed yesterday.